Important streptococcal virulence factor which cleaves human fibronectin and degrades vitronectin. 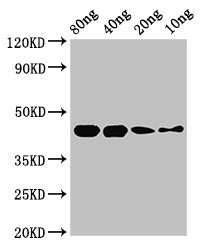 Also cleaves human IL1B precursor to form biologically active IL1B. Can induce apoptosis in human monocytes and epithelial cells in vitro, and reduces phagocytic activity in monocytic cells. Thus, may play a role in bacterial colonization, invasion, and inhibition of wound healing (By similarity).